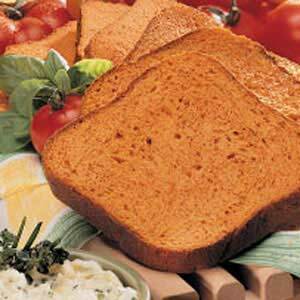 Why not try something different - this Tomato Bread recipe is perfect for serving with salad. Part of the liquid involved in the dough making is replaced iwth tomato puree, which is what gives this mixture an unusual colour and flavour. Unusual AND delicious. To prepare the yeast liquid, blend the fresh yeast in 150ml of the warm water until it has dissolved OR dissolve 1 teaspoon sugar in the warm liquid, then sprinkle in the dried yeast. leave in a warm place for 10 minutes or until dissolved and frothy. Blend the tomato puree with the remaining water. Mix the flour and salt together and rub in the fat. Add the yeast liquid and tomato liquid to the dry ingredients. Mix to form a firm dough, adding extra flour if it is too sticky to handle. Turn the dough onto a lightly floured surface, and knead until smooth and elastic and no longer sticky. It will take about 10 minutes by hand - or again, if you have a mixer with a dough attachment, it will take 2-3 minutes. Shape the dough into a ball, place inside a large oiled polythene bag and leave to rise until it is doubled in size. Remove from the bag, and punch down. Knead again until the dough is firm, about 2 minutes. Shape into loaves and/or rolls. The loaves or rolls may be left plain, lightly dusted with flour, or brushed with milk or egg wash before baking. cover and prove. Bake the loaves in the centre of a hot oven(230°C) for about 40 minutes for a large tin loaf; 30-35 minutes for small tin loaves, or until the loaves shrink slightly from the sides of the tin and the crust is deep golden brown. Bake large cob loaves for 35-40 minutes; small cob loaves for approximately 30 minutes; dinner rolls for 15-20 minutes.